The slopes and lift network of Les Arcs are among the most extensive in the world. More than 100 pistes for all ability levels add up to 200km of marked trails, served by more than 60 lifts. The skiable vertical of 2,026m is world class and the terrain available is more than doubled if you purchase the Paradiski pass (425km) which then includes the runs of neighbouring and lift-connected La Plagne. All of the skiing is well integrated with a high-speed lift network – there are no walks or bus rides required to make connections – and you can reach a very snowsure height of 3,226m. But you don’t need to head that high for great snow; most slopes north facing with extensive snowmaking systems so snow cover is rarely a problem. Unsurprisingly, given the scale of opportunities available, Les Arcs offers something for everyone: wide, gentle green pistes; steep, high-altitude glacier runs well above the treeline; sheltered descents through the forest; as well as a vast amount of off-piste terrain in between all these groomed slopes. The longest groomed trail is 7km in length and the 19 black runs adding up to some 43km of piste in that category alone is one of the highest percentage of steep terrain in the Alps – but still leaves nearly 160km of fast cruising terrain suited to beginners and intermediates. Les Arcs has a great reputation for off-piste terrain; the resort covers a huge area and much of it is outside the groomed motorways. The north face of the Aiguille Rouge is highly regarded with its long ridge opening up a myriad of off-piste options in what are the few remaining areas of the Tarentaise not yet filled with lifts and pistes. Iconic trails include the steep Couloir en S which pitches at up to 45 degrees and the 7km, 2,000m-vertical descent from the top of the Aiguille Rouge down to Villaroger. It’s also a popular excursion to take the Vanoise Express over to La Plagne and then ski down through the Nancroix forest. Given the scale of terrain available, if you’re not totally familiar with the dangers of off-piste skiing it’s essential to employ a guide but there’s also the Avalanche Parc up at Col de la Chal where you can research avalanche information and practice using search and rescue equipment free of charge. If you prefer to stay on the piste but experience ungroomed terrain, you can choose one of the 10 runs which are made safe and signposted by ski patrol but are left ungroomed: Varet, Crêtes, Dou de l’Homme, Lanches, Robert Blanc, Génépi, Bois de l’Ours, les Bosses, les 2 Têtes and Malgovert pistes. Les Arcs also has a speed riding school up at Arc 2000, the largest in France, where you can hit the powder with a small paragliding sail on your back to get some really big air on your descent. You don’t need to be a pro skier to do it, just confident on your skis. Taster sessions are €85 with a full week’s course €475. 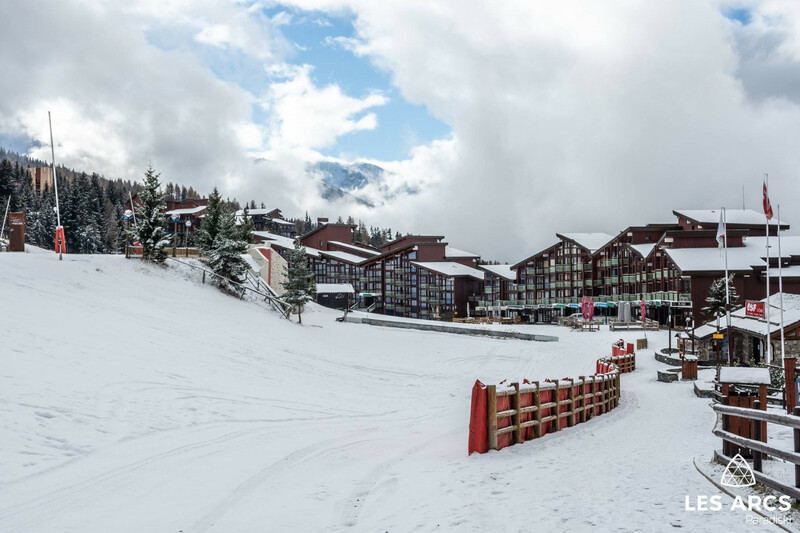 Les Arcs is a very family-oriented resort, on and off the slopes, with 75-percent of terrain rated easy or intermediate and more than 50 blue runs to choose from. In general terms the terrain becomes progressively more challenging the further you ascend with gentle runs through the woods down at Arc 1600, then the heart of the ski area is home to many wide cruising blue and red pistes as you move above the treeline, and then the upper runs on the exposed Aiguille Rouge offer some of the greatest challenges. A sign as you board the cable car up here advises that only good skiers should attempt to ski down. There are red as well as black options. The resort has a long-standing reputation for excellence in ski tuition dating right back to the 1970s when it pioneered ‘ski evolutif’ which saw first-timers learn proper technique (rather than progressing from snowplough) on progressively longer skis. This teaching method was superseded by the arrival of carving skis, but Les Arcs has sought to maintain its leading status as a teaching resort and operates a number of learner-only areas close to the resort bases, complete with easy to ride conveyor lifts serving very gentle gradients. The most recent opening is at Arc 2000 close to where the Olympic Flame is located commemorating the resort’s role in the 1992 Albertville Olympics. Both adult and child beginners are welcome to use these facilities. Once all are capable of basic turns, families will all enjoy a run down the Milka piste at Arc 1800 which is complete with information panels on local fauna and flora and cut ot shapes of the same on the off chance you don’t spot the real thing out on the snow. The once you’re more confident still you can test just how fast you’re sliding on the automated speed test course up at Arc 2000. The start of the course is accessed from the Plagnettes chair lift and at the bottom an electronic sign will tell you how fast you’ve skied. Les Arcs is keen to stress that the point of this is to warn of the dangers of excess speed on the piste, not to encourage speeding! Les Arcs plays a very important part in the history of freestyle. Always a pioneer of ‘nouveau’ snow sport, something very similar to a snowboard was seen on the slopes here some years before Jake Burton created ‘the first’ snowboard, and many other sliding devices too, most notably the monoski, which were popular here when unknown elsewhere. Ski movies of the modern variety were also first shot in Les Arcs, including the pioneering Apocalypse Snow films. The main terrain park here takes its name from those famous films. The huge Apocalypse Park in the heart of the ski area just above Arc 1600 has a vast array of terrain features and lines for all ability levels over tables, hips, a funbox, pyramid and jumps of various sizes. There are other attractions dotted around the huge area too, including a great boardercross course up at Arc 2000 where the Piste du Plan Vert is divided into two rolling boardercross routes for different confidence levels. There’s also a second smaller park, the Rey Park, with two lines suitable for novices or advanced riders, as well as a second boarder cross course at the opposite end of the slopes at Peisey Nancroix, with access from the top of the Peisey chair lift. With a Paradiski pass you can also head across the Vanoise Express lift for over snow access to La Plagne where more world class terrain parks await just minutes away. You can spend your ski holiday entirely in Les Arcs and never think of making the seven-minute crossing to La Plagne. Les Arcs is a huge ski area in its own right, one of the world’s 50 biggest in fact, so it is not as if you’ll run out of exciting terrain just skiing there. But it would be a missed opportunity not to ride the remarkable double decker €15m cable car which stretches 1.8km across the valley, at its highest point 280m above the valley floor (second only in height to Whistler Blackcomb’s newer Peak2Peak gondola). The lift takes you from Peisey Nancroix on the Les Arcs side over to Les Coches Montchavin on the la Plagne side to create Paradiski (425km/135 lifts) which it is among the third largest ski regions in the world. There are similarities to the La Plagne side – a 2000m+ vertical, masses of terrain for all standards, multiple modern base villages and upper runs topped by a glacier. But there are differences too. La Plagne has several traditional low elevation villages like Montalbert on the far side of the piste map, oozing Gallic ambience. If you head straight there first thing in the morning, you could try to ski the full length of Paradiski back over to Villaroger on the far side of the Les Arcs sector – most good skiers manage it in 2-3 hours, one way with no stops. It’s possible to buy a full Paradiski ticket for the duration of your stay, or, at a slightly lower cost, a ticket valid for one or two days skiing over in La Plagne during a week. Hemingway's Café, Résidence Hameau des Glaciers, Arc 1950 (+33(0)4 79 04 25 51) is the place to go for breakfast in Arc 1950. Hemingway's provides a buffet of traditional French favourites in a homely environment. If it’s a nice morning you can take your coffee and croissant out on to the sun-filled terrace. Brasserie Le 1950, Manoir Savoie - Arc 1950 (+33 (0)479 231 000) Open from 7am daily this stylish Brasserie gives the slightly surreal, but deliciously tasty, experience of a full American breakfast in a Parisian styled brasserie nearly 2,000m up in the French Alps. It’s certainly a different way to start the day if you fancy a change from a coffee in your apartment with a croissant from the local boulangerie. l’Arpette, Arc 1800 (+33 (0)4 79 07 45 80) is arguably the best of the altitude restaurants in Les Arcs, located close to the terrain park in the centre of the ski area. There’s a choice of table or self service restaurants, each with an onus on homemade cooking – be it Savoyard specialities or pizza, with locally sought ingredients where possible. There’s also a huge deck where there’s sometimes live music for a great après ski vibe later in the day. Aux Enants Terribles, Peisey-Vallandry (+33 (0) 4 79 07 45 80). A popular chalet style restaurant with a large terrace on the Peisey side of the ski area, at the top of the Vallandry chairlift. A good mix of local and international cuisine, including pizza, is served; the service is friendly and the value good. There’s a small but frequently changing menu and reservations are strongly recommended as it’s usually fully booked if you just roll up. Restaurant Le Savoy, Arc 2000 (+33 (0)4 79 07 73 00) is one of the highest establishments at the resort both in terms of altitude and star rating, more significantly still it has almost top marks on TripAdvisor – more than half the clientele rating it as excellent. What’s so good? The Savoyard cuisine is wonderfully prepared and presented by attentive, but not over attentive, staff and the location and ambience too are exceptional. Chez Clarisse, Place Haute, Les Villards, Arc 1800 (+33 (0)4 79 06 48 34) is a cosy, rustic establishment with wood-clad interiors, run by a former French ski champion and rather tucked away in Arc 1800 in the Les Villards district. But it’s well worth the effort to hunt down, having built a reputation for excellent food and service. The chef seeks out local cuisine and the menu, while focused on traditional regional cuisine, varies slightly depending on what’s in season. Le Chalet de Luigi, Le Frioulan, Arc 1950 - Le Village (+33 (0)4 79 00 15 36). Arguably the best choice for Italian food in Les Arcs, Chalet de Luigi specialises in cuisine from the Friuli region in the far northeast of the country, above Venice and bordering Austria and Slovenia, which is particularly known for its fine hams. It's happy hour from 5-6pm and there are early evening dinner concerts on Mondays and Thursdays. La Cabuche, Arcadien Hotel, Résidence Les Adrets, Arc 1600 (+33 (0)4 79 04 16 00). In Arc 1600 La Cabuche is the best choice for unmissable but affordable homemade Savoyard specialities including tartiflette, fondue and raclette. The simply but cleanly furnished dining room offers local flavours within these traditional regional dishes. Les Arc 1800 has the biggest choice of après ski venues, by a long way, in Les Arcs with more than 20 venues to choose from. Red Hot Saloon, Galerie des Villards, Arc 1800. Known to locals as the ‘Red Bar,’ it is one of the liveliest of the lot, open to 2am every night it normally operates a happy hour to 10pm nightly. There’s a large dance floor and often live rock bands or DJs with a great international vibe. Piano Bar, Hotel du Golf, Village du Charvet, Arc 1800 (+33 (0)4 79 41 43 43) Probably the most sophisticated option for après ski in Les Arcs, the Hotel du Golf’s piano bar has live bands playing most evenings, including pianists and popular jazz groups. This is the place to relax with an aperitif or cocktail.